Our professionals repair washing machines made by any brand, specialize in home washers and their services, and take care of everyone’s needs within a reasonable time. Trust us to check, maintain, fix and install your washer. The technicians at our Pay less Appliance Repair in Santa Clarita, CA, are friendly, skilled, courteous and experienced. With years in this job, we can fix any problem related to washing machines and thanks to our good preparation our technicians can help in a short time. The services offered by our team cover your repair, replacement and installation needs and are performed with respect to your private sphere. Our intention is to help our customers in Santa Clarita at the quickest possible time. When washing machines make noises, fail to latch or drain, emit bad smells or leave soap residue on clothes, it’s time to call our team. One of our washing machine technicians will assist you shortly. We offer washer troubleshooting in order to eliminate components and find which one of them causes trouble. Equipped to check the parts and trained to fix and replace them, our technicians can repair your laundry machine. Whatever the nature of the problem, you can be sure that it will be detected and fixed. Rest assured that our washing machine repair service includes the replacement of belts, switches, hoses, timers, pumps and any other damaged part. Let us assist you every time you encounter washer issues. 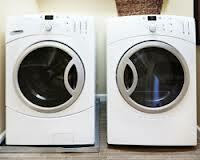 We offer washing machine repair in Santa Clarita and help in timely fashion. When you depend on our team, you can be sure that the job will be done properly and on time. You can count on us for emergency or casual repairs, but also for routine service and new washer installation. Whatever your washing machine needs are, they are all handled to your satisfaction by our company in California. Call us if you want quotes, to make an appointment or to ask questions.